History-C is a programming language design by Denis Ritchie in AT & T Bells labs in 1972. Versions-Latest version of C is C11. C language type discipline is static and weak where as of PHP is dynamic and weak. Extension- File extension for C is .c, .h. Paradigms-C paradigms are imperative ,procedural and structural. C is used for writing highly intensive application. C programming doesn’t do string copying do for error checking and bound checking. C is slower in certain condition as compared to PHP. Filesafe IO and system calls are not offered by C.
C doesn’t include any garbage collector Boehm GC can be used as a garbage collector for C.
C support manual memory management with library tools malloc and free. C use semicolon as statement terminator and comma as for separation. Type identifiers supported by C are int8_t, uint8_t, int16_t, uint16_t, int32_t, uint32_t, int64_t, uint64_t, int, unsigned int, char, unsigned char, short ,long, double. C support single precision float, double and long double. C support single precision and double precision complex numbers. C support fixed size array and one-dimensional dynamic size array. In C syntax for accessing the array is name[index]. C doesn’t support associative array using third party we can include these types of array in libraries to used it. C use strcat() function for string concatenation. The system is very rigid in C. C doesn’t let any mistake get into the environment and can be frustrating in the development process when looking for bugs. 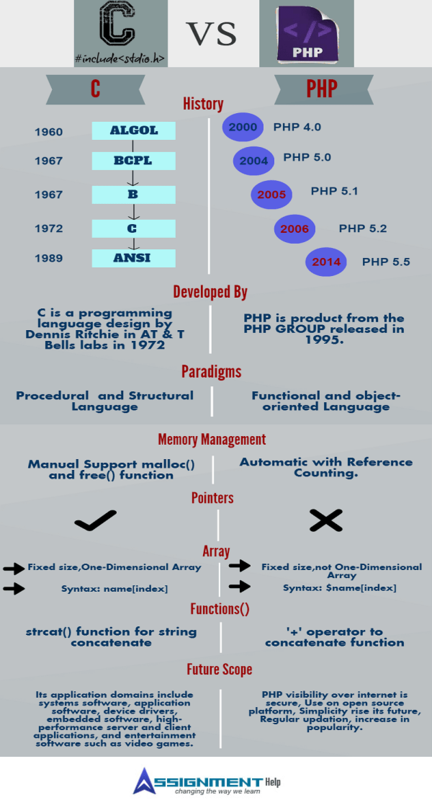 History-PHP is product from the PHP GROUP released in 1995. Versions- 5.5.14 is the latest version of PHP. PHP language type discipline is dynamic and weak. Extension- PHP extension are .php, .php3,.php4, .php5, .phtml ,phps. Paradigms- PHP is imperative, functional, object-oriented and reflective. PHP language doesn't support pointers. PHP falls short for such type of application. PHP programming do string copying and donot do for error checking and bound checking. PHP is faster as compared to C.
Filesafe IO and system calls,PHP support for the both. PHP support garbage collection and there is also gc_enable function. PHP support automatic memory management with reference counting. PHP use semicolon for terminating statement doesn’t use commas. Type identifiers support by PHP are 32 bit unsigned int and 64 bit signed bit. PHP support double precision float and single precision float, double and long double. PHP doesn’t support complex numbers. PHP doesn’t support fixed size array it support only one-dimensional dynamic size array. In PHP syntax for accessing the same array id $name[index]. Built in PHP type array are associative type also PHP internally include the numerical indexes of the array. PHP use + operator to concatenate the function of the data structure. General permissiveness of the programs has PHP to be more lenient.PHP is more forgiving with new mistakes. PHP visibility over internet is secure because use on open source platform.